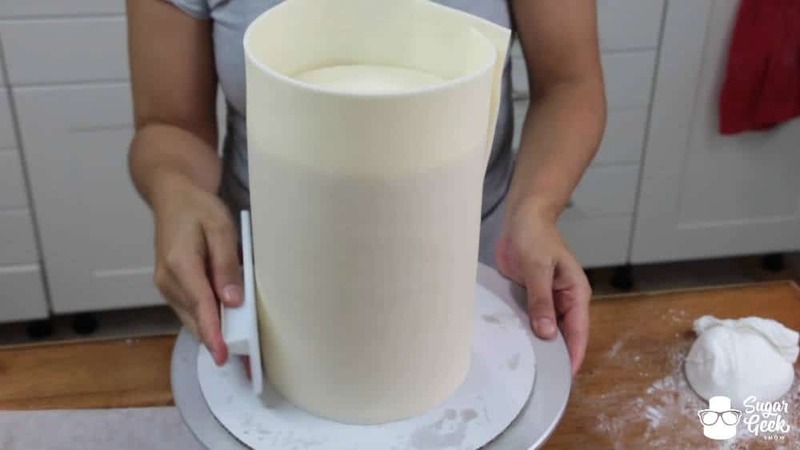 This week we’re going to show you an easier way to cover a double barrel cake in fondant. If you’ve ever tried to drape a double barrel you know exactly what we’re talking about. If you have never attempted a double barrel cake or are thinking, “what the heck is a double barrel cake?”, we show you exactly how to do one in our Double Barrel Blog Post. 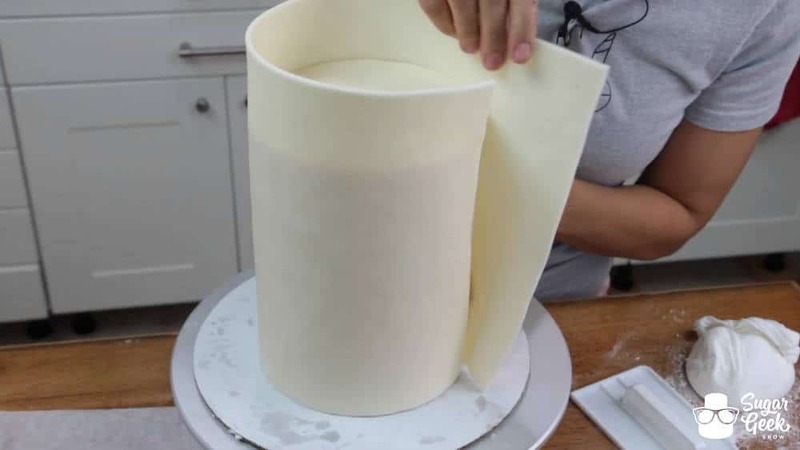 In order to drape a double barrel, you have to roll out a huge amount of fondant into a huge piece to fit the cake. Working with a piece that size is no easy task. 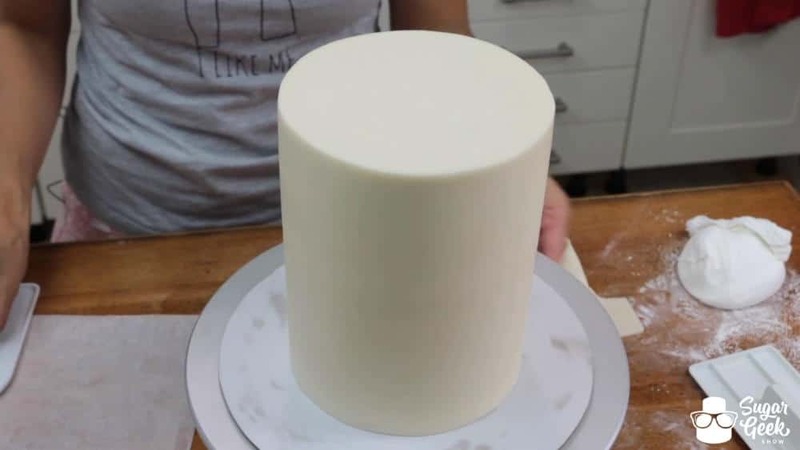 Then say you do miraculously get the fondant onto the cake unharmed, the cake is so tall that the fondant really has a long way to fall and often times the weight of it causes tearing quicker then you can do anything about it. After learning the paneling method I will never drape another double barrel cake again, or a square one either for that matter. 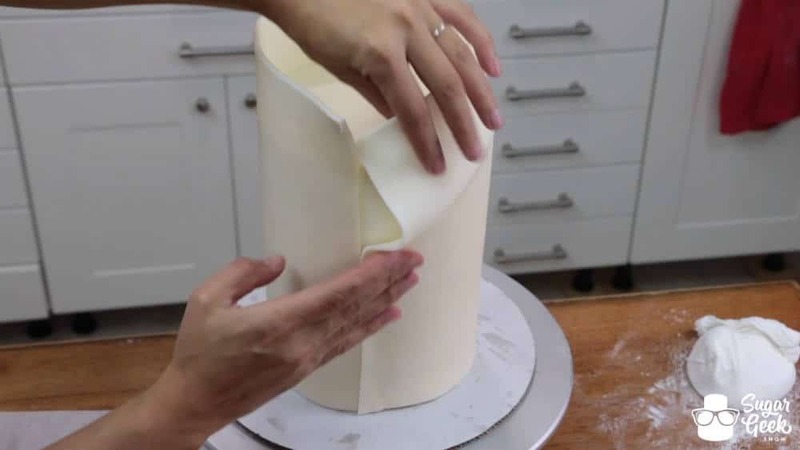 Roll out a small piece of fondant large enough to cover the top of your cake with a little to spare. 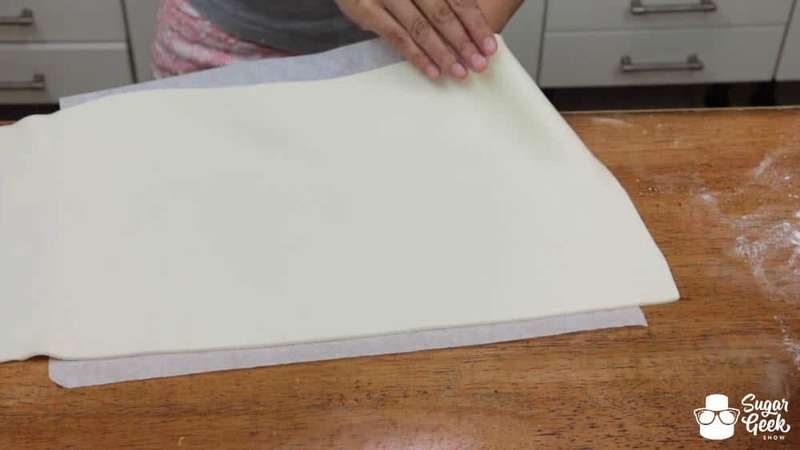 Liz is covering a 6″ cake so she rolls the piece out to about an 8″ circle. 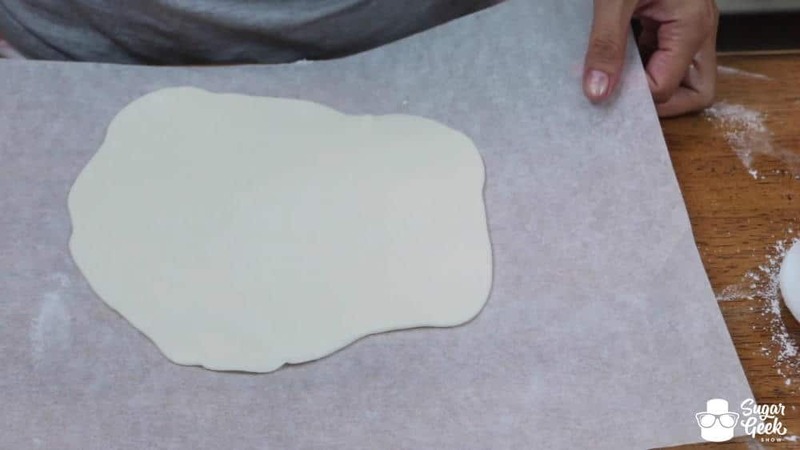 Place the fondant onto some parchment and place in the freezer for 5 minutes to chill. This will make it much easier to cut a nice clean edge. 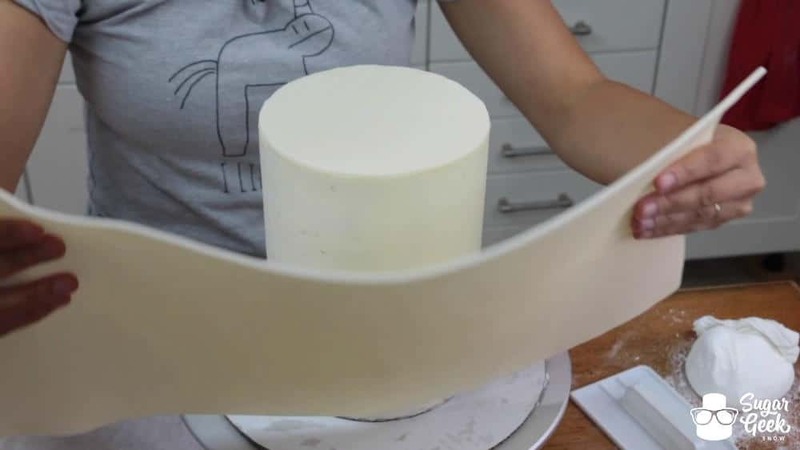 Meanwhile, roll out a piece of fondant wide enough to wrap around your cake and tall enough to cover it with a little to spare. 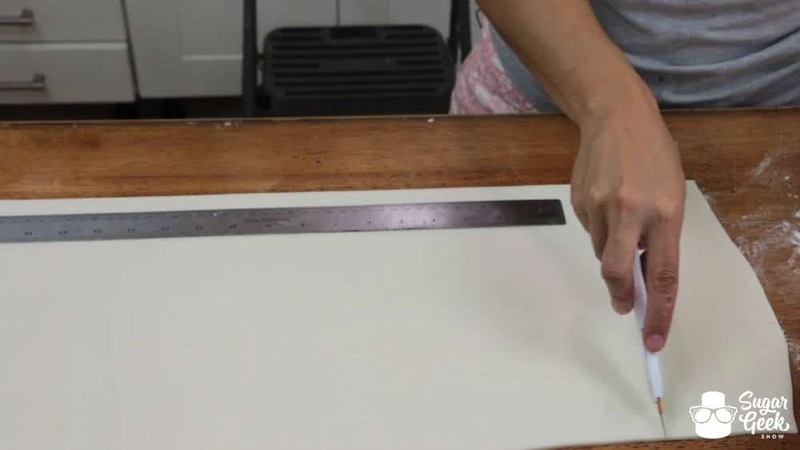 Use a ruler to measure and cut your fondant into a rectangle the correct size for your cake. 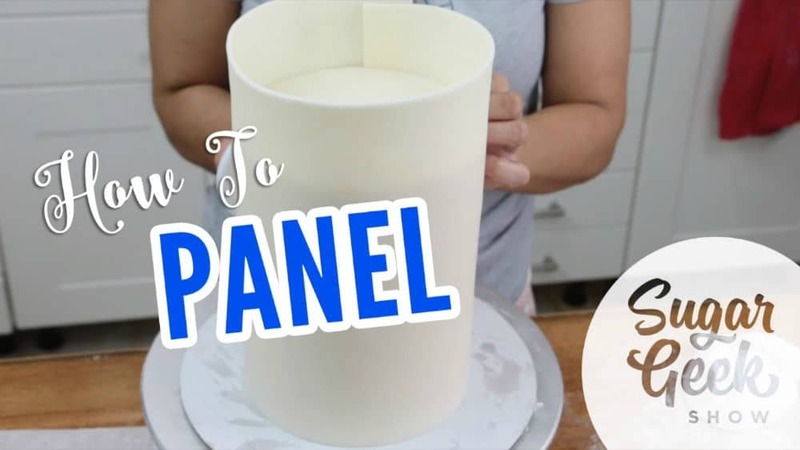 Make sure the bottom of your panel is nice and straight for the bottom of the cake. 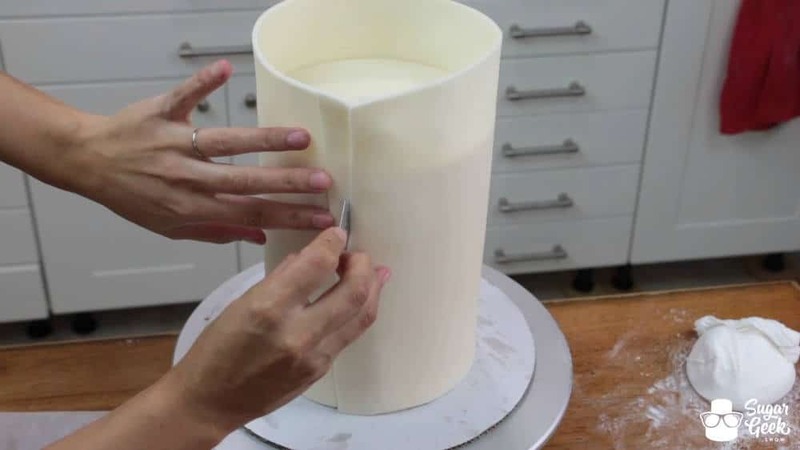 Liz’s cake is 8″ tall and 6″ wide so she is cutting her piece approximately 10″ tall and 19″ wide. 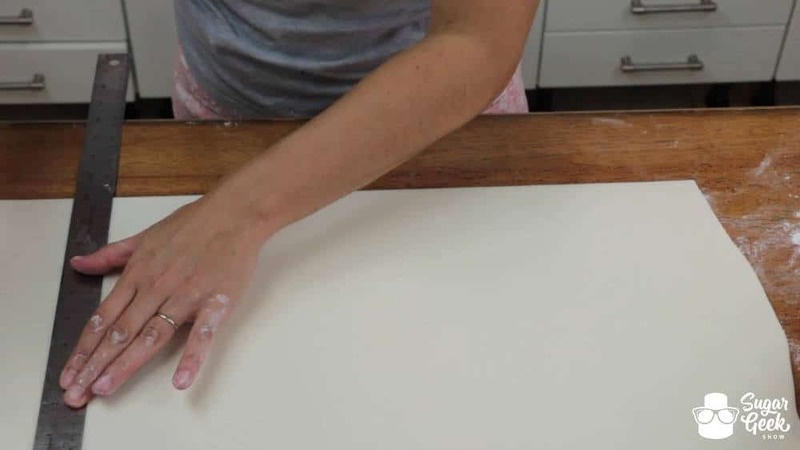 Transfer this fondant to a piece of parchment to place in the freezer to chill for 5 minutes as well. 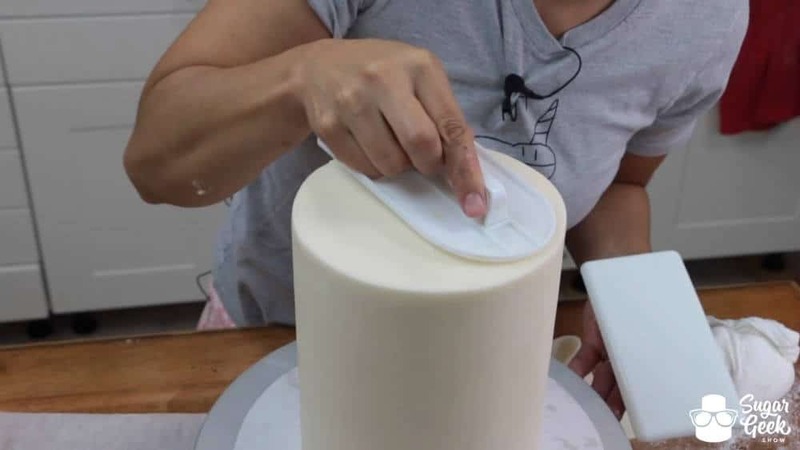 Take the first piece of fondant out of the freezer and place it on top of your cake and smooth it down. 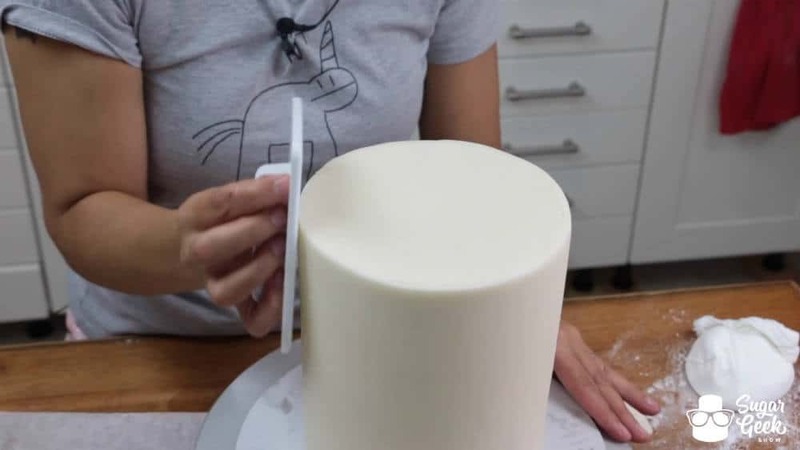 Using a super sharp, super clean razor blade cut off the excess fondant to the exact size of your cake top. 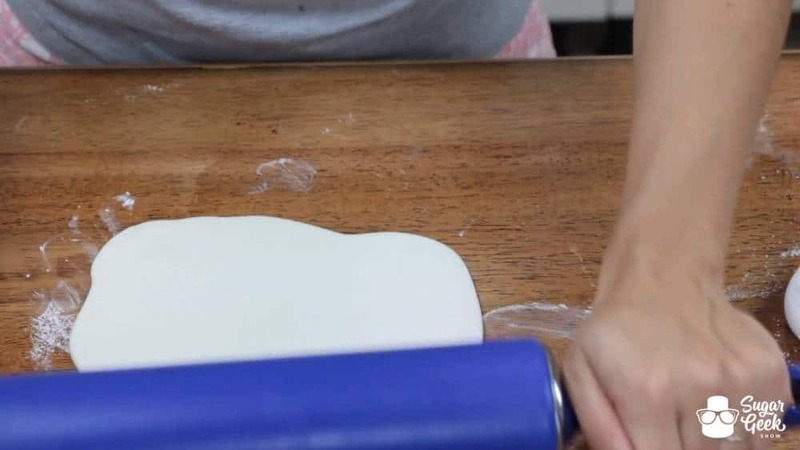 Take your other piece of fondant out of the freezer. It should be very stiff and easy to pick up without distorting or drooping. Wrap the piece around your cake making sure to press it firmly against the cake sticking it to the buttercream all the way around. 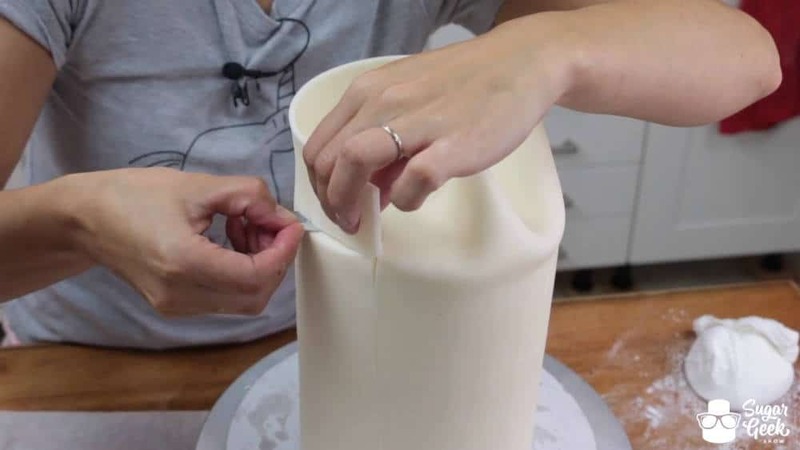 Use a fondant smoother to smooth your fondant to perfection. 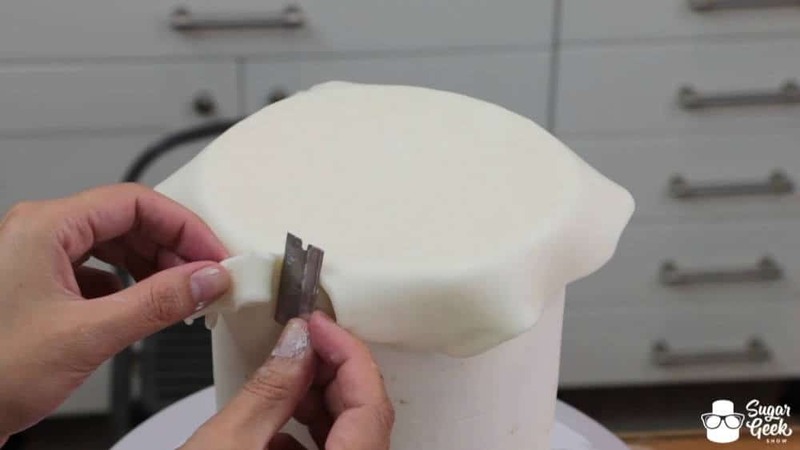 Again with your clean and sharp razor blade cut the fondant where the two ends overlap. Cut a nice straight line through BOTH pieces of fondant. 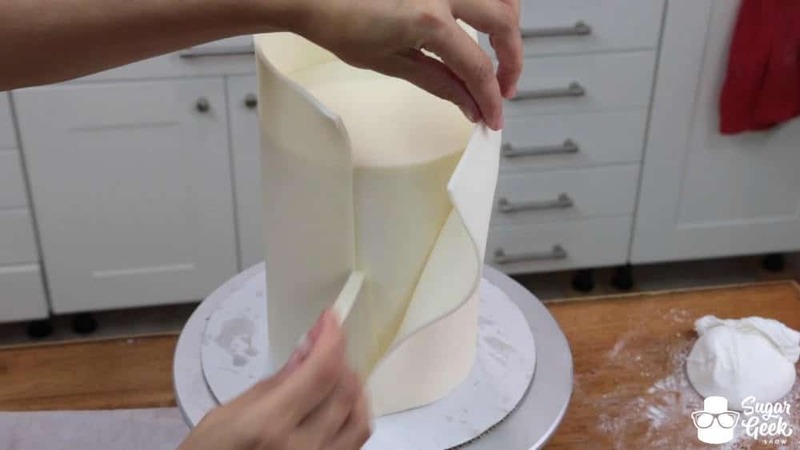 Remove the cut fondant being sure to pull back the overlapped end and remove the cut piece from underneath. Push the panel ends together, the ends should line up perfectly giving you a nice straight seam. Take your clean, sharp razor blade once again and keeping it flat on top of your cake, cut off the excess fondant from the top. Use a smoother to push the seam together and smooth it until its unnoticeable. And just like that you have a perfectly paneled cake! A beautiful double barrel with sharp, clean edges, zero tears and zero tears. 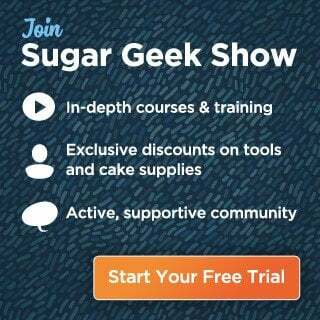 Have you tried both methods of covering a cake in fondant? Which do you prefer? Some people use the paneling method all the time. It really is about finding what works best for you! We’re here to give you as many options as possible so you can figure it out.